VET can contribute to this objective. This indicator is a proxy measure for the contribution of VET to tertiary level education attainment among the young population. The indicator below is defined as the number of short cycle VET graduates () in a given year, expressed as a percentage of all graduates from first programmes at tertiary level of education () in that year. This is assumed to be an underestimated proxy measure of vocational education attainment at tertiary level (). 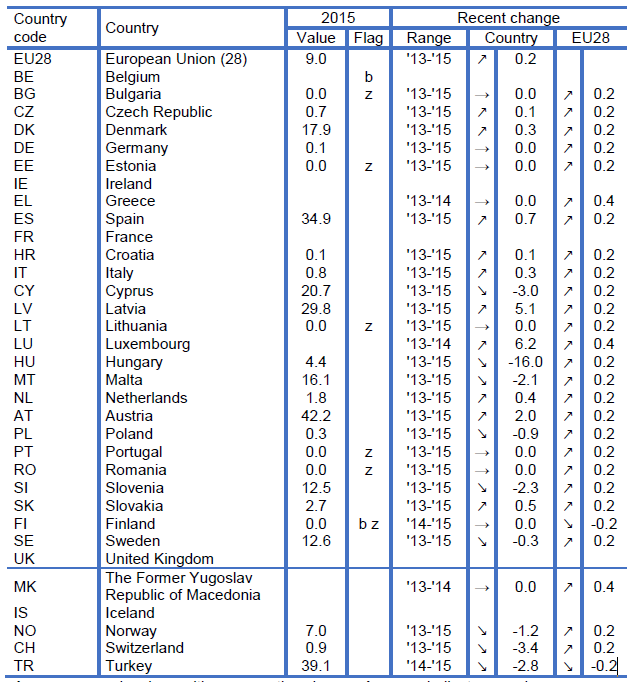 EU averages are estimated from available country data. 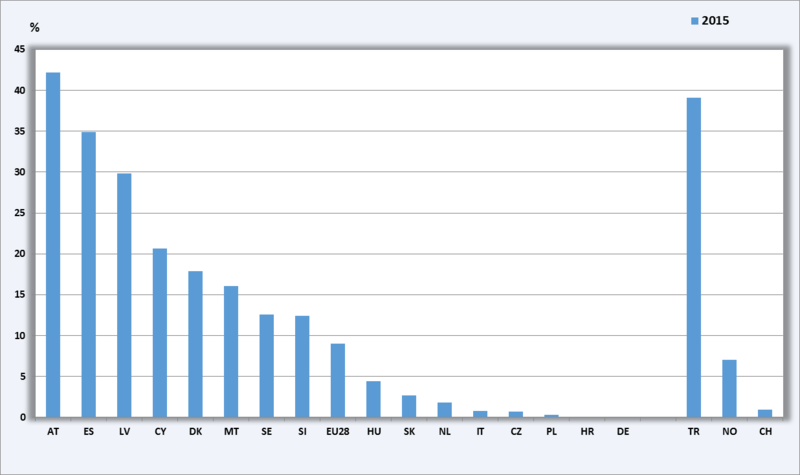 Source: Cedefop calculations based on Eurostat data/UOE data collection on education. In 2015, 9.0% of first time tertiary education graduates in the EU were short cycle VET graduates. There is substantial variation in this percentage across the EU, ranging from 42.2% (Austria) to some countries reporting a share close to zero (for example: Poland, Croatia, and Germany). In Hungary (4.4%), Slovakia (2.7%), the Netherlands (1.8%), Italy (0.8%), and the the Czech Republic (0.7%), the share of short cycle VET graduates among first time tertiary education graduates was also well below the EU average. Comparing the non-EU countries for which data are available with the EU Member States, the percentage of first time tertiary education graduates in Turkey in 2015 who were short cycle VET graduates (at 39.1%) was in the top of the range; in Norway (at 7.0%) this share was slightly below and in Switzerland (at 0.9%) it was well below the EU average. Indicator available from 2013 onwards. Thus, trends based on two points only (mark ▪). The EU28 values are based on 23 countries (missing: BE, CY, FR, IE, UK). (b) Eurostat: "break in time series". (u) Eurostat: "low reliability". (z) Eurostat: "not applicable". (e) Eurostat: "estimated". Graduates from ISCED 554 programmes. Graduates from programmes assigned to ISCED 544, 554; 645, 655, 665; 646, 656, 666; 746, 756 or 766. The concept of “tertiary level VET” is not clearly defined at present. The limitation to short cycle VET (ISCED 554) may be too restrictive.